Oral surgery means a series of interventions undertaken in the firm and tender tissue area. 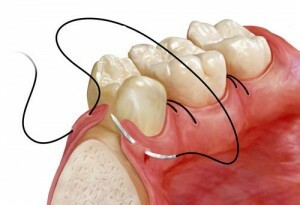 Those include: tooth extraction, when unable to undertake the process of conserving and healing (by cleaning the canals and filling) and in the case when there has been a clinical examination, whose results are the indication for the tooth extraction, further more by teeth that haven’t sprouted yet and teeth that no longer have the eruptive function of their own (mostly in case of the third molar). By the extraction of the particular tooth it is possible that it results in opening an unwanted canal from the tooth to the sinus, therefore it is neccessary to surgically close the oroantral canal. Oral surgery includes the following interventions as well apicoectomy, removal of granuloma, and cystectomy, treatment and removal of cysts that are usually diagnosed on RTG-shots and look like a ball-like illuminations. Pre-prothetic surgery specializes in preparing the tooth tissue and mouth cavity in order to make the future structure accept the prosthetic retension- and stabilization elements as good and easy as possible.